Pope Pius XII, born Eugenio Maria Giuseppe Giovanni Pacelli (March 2, 1876 – October 9, 1958), reigned as the 260th Pope, the head of the Roman Catholic Church, and sovereign of Vatican City State from March 2, 1939 until his death in 1958. Pius is one of the few popes in recent history to exercise his right of papal infallibility in issuing the apostolic constitution Munificentissimus Deus, which defined ex cathedra the dogma of the Assumption of Mary. He also promulgated 46 encyclicals, including Humani Generis, which is still relevant to the Church's position on evolution. He also decisively eliminated the Italian majority in the College of Cardinals with the Grand Consistory in 1946. Most sedevacantists regard Pope Pius XII as the last true Pope to occupy the Holy See. His canonization process progressed to the Venerable stage on September 2, 2000 under Pope John Paul II. Pius's leadership of the Catholic Church during World War II (specifically centering around his response to the Holocaust) remains the subject of continued historical controversy. While he did make attempts to shelter Jews and to encourage countries to accept them as refugees, many critics posit that he did not do enough to combat the institutionalized racism of the Nazi regime. This issue is often linked to the strong diplomatic ties between Pius XII and Germany (developed during his roles as nunciate and pope). These criticisms are made forcefully in John Cornwell's Hitler's Pope, though they are themselves being criticized for being overly one-sided. On March 2, 1876, Eugenio Pacelli was born in Rome into a wealthy aristocratic family with historic ties to the papacy. His grandfather, Marcantonio Pacelli, was the Under-Secretary in the Papal Ministry of Finances, and served as Secretary of the Interior under Pope Pius IX from 1851 to 1870. He also founded the Vatican's newspaper, L'Osservatore Romano, in 1861. His cousin, Ernesto Pacelli, was a key financial advisor to Pope Leo XII; his father, Filippo Pacelli, was the dean of the Sacra Rota Romana; and his brother, Francesco Pacelli, became a highly regarded lay canon lawyer, who is credited for his role in negotiating the Lateran treaties in 1929, thus bringing an end to the Roman Question. At the age of twelve, Pacelli announced his intentions to enter the priesthood instead of becoming a lawyer. After completing his studies at the state primary schools, Pacelli received his secondary, classical education at the Visconti Institute. In 1894, at the age of eighteen, he entered the Almo Capranica Seminary to begin study for the priesthood and enrolled at the Pontifical Gregorian University and the Appolinare Institute of Lateran University. From 1895–1896, he studied philosophy at University of Rome La Sapienza. In 1899, he received degrees in theology and in utroque jure (civil and canon law). Pacelli was ordained on Easter Sunday, April 2, 1899, by Bishop Francesco Paolo Cassetta—the vice-regent of Rome and a family friend—and received his first assignment as a curate at Chiesa Nuova, where he had served as an altar boy. In 1901, he entered the Department of Extraordinary Ecclesiastical Affairs, a sub-office of the Vatican Secretariat of State, where he became a minutante at the recommendation of Cardinal Vannutelli, another family friend. In 1904, Pacelli became a papal chamberlain and, in 1905, a domestic prelate. From 1904 until 1916, Father Pacelli assisted Cardinal Gasparri in his codification of canon law. He was also chosen by Pope Leo XIII to deliver condolences on behalf of the Vatican to Edward VII of the United Kingdom after the death of Queen Victoria. In 1908, he served as a Vatican representative at the International Eucharistic Congress in London, where he met with Winston Churchill. In 1910, he represented the Holy See at the coronation of King George V.
In 1908 and 1911, Pacelli turned down professorships in canon law at Roman and American universities, preferring to concentrate on his legal/religious careers. Pacelli became the under-secretary in 1911, adjunct-secretary in 1912, and secretary of the Department of Extraordinary Ecclesiastical Affairs in 1914—succeeding Gasparri, who was promoted to Cardinal Secretary of State. During World War I, Pacelli maintained the Vatican's registry of prisoners of war. In 1915, he travelled to Vienna to assist Monsignor Scapinelli, the apostolic nuncio to Vienna, in his negotiations with Franz Joseph I of Austria regarding Italy. In April 1917, Pope Benedict XV appointed Pacelli as papal nuncio to Bavaria, consecrating him as a titular bishop of Sardis and immediately elevating him to archbishop of the Sistine Chapel on May 13, 1917. Soon after, he left for Bavaria, where he met with King Ludwig III and Kaiser Wilhelm II. As there was no nuncio to Prussia at the time, Pacelli was, for all practical purposes, the nuncio to all of the German Empire. These responsibilities were publicly affirmed when the Vatican officially extended his nunciature to Germany and Prussia in 1920 and 1925, respectively. Many of Pacelli's Munich staff would stay with him for the rest of his life, including Sister Pasqualina Lehnert—housekeeper, friend, and adviser to Pacelli for 41 years. During the short-lived Munich Soviet Republic of 1919, Pacelli was one of the few foreign diplomats to remain in the country. He faced down a small group of Spartacist revolutionaries and reportedly convinced them to leave the offices of the nunciature without incident. The oft-repeated anecdote, reminiscent of Pope Leo I turning Attila the Hun away from the gates of Rome, is often cited as a formative experience that informed Pacelli's later views on Communism and on leftist movements in general. Similarly, he later dispersed a mob attacking his car by raising his cross and blessing his assailants. During the 1920s, Pacelli succeeded in negotiating concordats with Latvia (1922), Bavaria (1925), Poland (1925), Romania (1927), and Prussia (1929), though he failed to reach such an agreement in Germany. Under his tenure, the nunciature was moved to Berlin, where one of his associates was the German priest Ludwig Kaas, who was known for his expertise in Church-state relations and was politically active in the Centre Party. Pacelli was made a cardinal on December 16, 1929, by Pope Pius XI. Within a few months, he was appointed Cardinal Secretary of State. In 1935, Cardinal Pacelli was named Camerlengo of the Roman Church. As Cardinal Secretary of State, Pacelli signed concordats with many non-Communist states, including Baden (1932), Austria (1933), Germany (1933), Yugoslavia (1935), and Portugal (1940). Such concordats allowed the Catholic Church to organize youth groups; make ecclesiastical appointments; run schools, hospitals, and charities; and conduct religious services. They also ensured that canon law would be recognized within some spheres (e.g., church decrees of nullity in the area of marriage). He also made many diplomatic visits throughout Europe and the Americas, including an extensive visit to the United States in 1936, where he met with Charles Coughlin and Franklin D. Roosevelt. Impressed by this meeting, Roosevelt appointed a personal envoy to the Holy See in December 1939, re-establishing a diplomatic tradition that had been broken since 1870 when the pope lost temporal power. Some historians have suggested that Pacelli, as Cardinal Secretary of State, dissuaded Pope Pius XI—who was nearing death at the time—from condemning Kristallnacht in November 1938, when he was informed of it by the papal nuncio in Berlin. The Reichskonkordat between Germany and the Holy See, signed on July 20, 1933, remains the most important and controversial of Pacelli's diplomatic achievements. Though the eventual signing of a national concordat with Germany was one of Pacelli's main objectives as secretary of state, it was the product of many years of unsuccessful negotations. As nuncio during the 1920s, he had made numerous attempts to obtain German agreement for such a treaty, and between 1930 and 1933, he attempted to initiate negotiations with representatives of successive German governments, but the opposition of Protestant and Socialist parties, the instability of national governments, and the care of the individual states to guard their autonomy thwarted this aim. In particular, the questions of denominational schools and pastoral work in the armed forces prevented any agreement on the national level, despite talks in the winter of 1932. Heinrich Brüning, leader of the Catholic German Centre Party and Chancellor of Germany, met with Pacelli on August 8, 1931. According to Brüning's memoirs, Pacelli suggested that he disband the Centre Party's governing coalition with the Social Democrats and "form a government of the right simply for the sake of a Reich concordat, and in doing so make it a condition that a concordat be concluded immediately." Brüning refused to do so, replying that Pacelli "mistook the political situation in Germany and, above all, the true character of the Nazis." Adolf Hitler was appointed Chancellor on January 30, 1933, and sought to gain international respectability and to remove internal opposition by representatives of the Church and the Catholic Centre Party. He sent his vice chancellor Franz von Papen, a Catholic nobleman and former member of the Centre Party, to Rome to offer negotiations regarding a Reichskonkordat. On behalf of Cardinal Pacelli, his long-time associate Prelate Ludwig Kaas, the out-going chairman of the Centre Party, negotiated first drafts of the terms with Papen. The concordat was finally signed, by Pacelli for the Vatican and von Papen for Germany, on July 20 and ratified on September 10, 1933. Between 1933 and 1939, Pacelli issued 55 protests of violations of the Reichskonkordat. Most notably, early in 1937, Pacelli asked several German cardinals, including Michael Cardinal von Faulhaber, to help him write a protest of Nazi violations of the Reichskonkordat; this was to become Pius XI's encyclical Mit Brennender Sorge. The encyclical, which condemns political ideology that "exalts race, or the people, or the State ... above their standard value and divinizes them to an idolatrous level," was written in German instead of Latin and read in German churches on Palm Sunday 1937. Pius XII's pontificate began on the eve of World War II, during which time the Pope attempted to follow a policy of neutrality mirroring that of Pope Benedict XV during World War I. After Germany invaded the Benelux during 1940, Pius XII sent expressions of sympathy to the Queen of the Netherlands, the King of Belgium, and the Grand Duchess of Luxembourg. When Mussolini learned of the warnings and the telegrams of sympathy, he took them as a personal affront and had his ambassador to the Vatican file an official protest, charging that Pius XII had taken sides against Italy's ally (Germany). In any case, Mussolini's foreign minister claimed that Pius XII was "ready to let himself be deported to a concentration camp, rather than do anything against his conscience." In the spring of 1940, a group of German generals seeking to overthrow Hitler and make peace with the British approached Pope Pius XII, who acted as a negotiator between the British and the German generals. In April 1941, Pius XII granted a private audience to Ante Pavelić, the leader of the newly proclaimed Croatian state, rather than the diplomatic audience Pavelić had wanted. This undeniable slight led an unattributed British Foreign Office memo to describe Pius as "the greatest moral coward of our age." In this, the Vatican's position was somewhat contradictory: While Pius XII did not officially recognize Pavelić's regime, he also did not publicly condemn the expulsions of Serbs perpetrated by Pavelić. However, the Holy See did expressly repudiate their policy of enforcing conversion to Catholicism in a memorandum dated January 25, 1942, from the Vatican Secretariat of State to the Yugoslavian Legation. Later in 1941, Pius XII interpreted Divini Redemptoris, an encyclical of Pope Pius XI, which forbade Catholics to help Communists, as not applying to military assistance to the Soviet Union. This interpretation assuaged American Catholics who had previously opposed Lend-Lease arrangements with the Soviet Union. In March 1942, Pius XII established diplomatic relations with the Japanese Empire. In May 1942, Kazimierz Papée, Polish ambassador to the Vatican, complained that Pius had failed to condemn the recent wave of atrocities in Poland. When Cardinal Secretary of State Maglione replied that the Vatican could not document individual atrocities, Papée declared, "[W]hen something becomes notorious, proof is not required." This situation came to a head with Pius XII's famous Christmas broadcast on Vatican Radio delivered December 24, 1942. It remains a "lightning rod" in debates about Pope Pius XII during the war, particularly the Holocaust. The majority of the speech spoke generally about human rights and civil society; at the very end of the speech, Pius seems to turn to current events, albeit not specifically, referring to "all who during the war have lost their Fatherland and who, although personally blameless, have simply on account of their nationality and origin, been killed or reduced to utter destitution." As the war was approaching its end in 1945, Pius advocated that the Allied leaders adopt a lenient policy towards war criminals, in an effort to prevent what he perceived to be the mistakes made at the end of World War I. The papal response to the Holocaust during World War II was both conflicted and inadequate. Though the level of Pius's culpability is a subject of tremendous debate, it is undeniable that his uncertainty and lack of commitment did little to improve the situation of the millions of Jews who were harassed, deported, and, in many cases, murdered. Pius engineered an agreement—formally approved on June 23, 1939—with Brazilian President Getúlio Vargas to issue 3,000 visas to "non-Aryan Catholics." However, over the next eighteen months, Brazil’s Conselho de Imigração e Colonização (CIC) continued to tighten the restrictions on their issuance, including requiring a baptismal certificate dated before 1933, a substantial monetary transfer to the Banco de Brasil, and approval by the Brazilian Propaganda Office in Berlin. This culminated in the cancellation of the program fourteen months later (after fewer than 1,000 visas had been issued), amid suspicions of "improper conduct" (i.e., continuing to practice Judaism) among those who had received visas. In early 1940, Isaac Herzog, the Chief Rabbi of Palestine, asked Cardinal Secretary of State Luigi Maglione to intercede on behalf of Lithuanian Jews facing deportation to Germany. This was one of the motivations leading to the Pope's conversation with German Foreign Minister Joachim von Ribbentrop on March 11, where he repeatedly protested the treatment of Jews at the hands of the National Socialist administration. In 1941, Cardinal Theodor Innitzer of Vienna informed Pius of Jewish deportations in Vienna. Later that year, when asked by French Marshal Philippe Pétain if the Vatican objected to anti-Jewish laws, Pius responded that the church condemned anti-Semitism, but would not comment on specific rules. Similarly, when Pétain's puppet government adopted the "Jewish statutes," the Vichy ambassador to the Vatican, Léon Bérard, was told that the legislation did not conflict with Catholic teachings. Valerio Valeri, the nuncio to France, was "embarrassed" when he learned of this publicly from Pétain and personally checked the information with Cardinal Secretary of State Maglione who confirmed the Vatican's position. In September 1941, Pius objected to a Slovakian Jewish Code, which, unlike the earlier Vichy codes, prohibited intermarriage between Jews and non-Jews. In October 1941, Harold Tittman, a U.S. delegate to the Vatican, asked the pope to condemn the atrocities against Jews; Pius replied that the Vatican wished to remain "neutral," reiterating the neutrality policy that Pius invoked as early as September 1940. In 1942, the Slovakian charge d'affaires told Pius that Slovakian Jews were being sent to concentration camps. On March 11, 1942, several days before the first transport was due to leave, the charge d'affaires in Bratislava reported to the Vatican: "I have been assured that this atrocious plan is the handwork of.… Prime Minister Tuka, who confirmed the plan… he dared to tell me—he who makes such a show of his Catholicism—that he saw nothing inhuman or un-Christian in it… the deportation of 80,000 persons to Poland, is equivalent to condemning a great number of them to certain death." The Vatican protested to the Slovak government that it "deplore(s) these... measures which gravely hurt the natural human rights of persons, merely because of their race." In August 1942, Pius advised Andrej Septyckyj (a Ukranian pastor) to "bear adversity with serene patience," in response to the latter's plea for assistance from the Vatican. By the time Septyckyj's missive reached the pope, it has been estimated that thousands of Ukrainian Jews had already been killed on the eastern front. On September 18, 1942, Monsignor Giovanni Battista Montini (who would later become Pope Paul VI), wrote to Pius, "[T]he massacres of the Jews reach frightening proportions and forms." Later that month, when Myron Taylor, U.S. representative to the Vatican, warned Pius that silence on the atrocities would hurt the Vatican's "moral prestige"—a warning that was echoed simultaneously by representatives from Great Britain, Brazil, Uruguay, Belgium, and Poland—the Cardinal Secretary of State replied that the rumors about genocide could not be verified. In December 1942, when Tittman asked Cardinal Secretary of State Maglione if Pius would issue a proclamation similar to the Allied declaration "German Policy of Extermination of the Jewish Race," Maglione replied that the Vatican was "unable to denounce publicly particular atrocities." In late 1942, Pius XII advised German and Hungarian bishops that speaking out against the massacres in the eastern front would be politically advantageous. Likewise, on April 7, 1943, Msgr. Tardini, one of Pius’s closest advisors, told Pius that it would be politically advantageous after the war to take steps to help Slovakian Jews. In January 1943, Pius would again refuse to publicly denounce the Nazi violence against Jews, following requests to do so from Wladislaw Raczkiewicz, president of the Polish government-in-exile, and Bishop Konrad von Preysing of Berlin. On September 26, 1943, following the German occupation of northern Italy, Nazi officials gave Jewish leaders in Rome 36 hours to produce 50 kilograms of gold (or the equivalent) threatening to take 300 hostages. Then Chief Rabbi of Rome, Israel Zolli, recounts in his memoir that he was selected to go to the Vatican and seek help. The Vatican offered to loan 15 kilos, but the offer proved unnecessary when the Jews received an extension. Soon afterward, when deportations from Italy were imminent, 477 Jews were hidden in the Vatican itself and another 4,238 were protected in Roman monasteries and convents. On April 30, 1943, Pius wrote to Archbishop Von Preysing of Berlin to say: "We give to the pastors who are working on the local level the duty of determining if and to what degree the danger of reprisals and of various forms of oppression occasioned by episcopal declarations… seem to advise caution.… The Holy See has done whatever was in its power, with charitable, financial and moral assistance. To say nothing of the substantial sums which we spent in American money for the fares of immigrants." On October 28, 1943, Weizsacker, the German Ambassador to the Vatican, telegraphed Berlin that the pope "has not allowed himself to be carried away [into] making any demonstrative statements against the deportation of the Jews." In March 1944, through the papal nuncio in Budapest, Angelo Rotta urged the Hungarian government to moderate its treatment of the Jews. These protests, along with others from the King of Sweden, the International Red Cross, the United States, and Britain led to the cessation of deportations on July 8, 1944. Also in 1944, Pius appealed to 13 Latin American governments to accept "emergency passports," although it also took the intervention of the U.S. State Department for those countries to honor the documents. When the church transferred 6,000 Jewish children in Bulgaria to Palestine, Cardinal Secretary of State Maglione reiterated that the Holy See was not a supporter of Zionism. In August 2006, extracts from the 60-year-old diary of a nun of the Convent of Santi Quattro Coronati were published in the Italian press, stating that Pope Pius XII ordered Rome's convents and monasteries to hide Jews during the Second World War. After the war, Pius became an outspoken advocate of political clemency, arguing that it should even be extended to war criminals. After the ban on the execution of such criminals was lifted in 1948, the Vatican also asked for a blanket pardon for all those who had received death sentences. Pius's anti-Communist activities also became more prominent following the war. In 1948, Pius became involved in the Italian election, declaring that any Italian Catholic who supported Communist candidates would be excommunicated and also encouraging Azione Cattolica to support the Italian Christian Democratic Party. In 1949, he authorized the Congregation for the Doctrine of the Faith to excommunicate any Catholic who joined or collaborated with the Communist Party. He also publicly condemned the Soviet crackdown on the 1956 Hungarian Revolution. Pius concluded concordats with Francisco Franco's Spain in 1953 and Rafael Trujillo's Dominican Republic in 1954. Such negotiations were necessary, as the rights of the Catholic Church (or its constituents) had been violated by repressive regimes in both countries. Likewise, Pius also excommunicated Juan Perón in 1955 for his arrests of church officials. Pius was dogged with ill health later in life. He died on October 9, 1958, in Castel Gandolfo, the papal summer residence. On September 2, 2000, during the pontificate of Pope John Paul II, Pius's cause for canonization was elevated to the level of Venerable. Rome's Chief Rabbi Elio Toaff also began promoting the cause of Pius to receive such posthumous recognition from Yad Vashem as a "righteous gentile." The Boy Scouts of America named their highest Catholic Award after him. 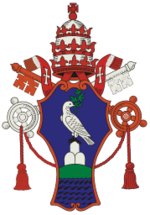 Pope Pius' Coat of Arms featured a dove, a symbol of diplomacy. Pope Pius XI died on February 10, 1939. Several historians have interpreted the conclave to choose his successor as facing a choice between a diplomatic or spiritual candidate: They view Pacelli's diplomatic experience, especially with Germany, as one of the deciding factors in his election on March 2, 1939, his 63rd birthday, after only one day of deliberation and three ballots. Pacelli took the name of Pius XII, the same papal name as his predecessor, a title used exclusively by Italian Popes. He was the first cardinal secretary of state to be elected Pope since Clement IX in 1667. He was also one of only two men known to have served as camerlengo immediately prior to being elected as pope (the other being Gioacchino Cardinal Pecci, who was elected as Pope Leo XIII). In a historically significant move, Pius exercised papal infallibility in endorsing ex cathedra the dogma of the Assumption of the Blessed Virgin Mary into heaven. This momentous decretal, entitled Munificentissimus Deus, was issued on November 1, 1950. Further, he consecrated the world to the Immaculate Heart of Mary in 1942, in accordance with the second secret proclamation of Our Lady of Fatima. Summi Pontificatus, Pius's first encyclical promulgated in 1939, condemned the "ever-increasing host of Christ's enemies." Humani Generis, promulgated in 1950, acknowledged that evolution might accurately describe the biological origins of human life, but at the same time criticized those who "imprudently and indiscreetly hold that evolution… explains the origin of all things." The encyclical reiterated the Church's teaching that, whatever the physical origins of human beings, the human soul was directly created by God. While Humani Generis was significant as the first occasion on which a pope explicitly addressed the topic of evolution at length, it should be noted that it did not represent a change in doctrine for the Roman Catholic Church. As early as 1868, Cardinal John Henry Newman wrote, "[T]he theory of Darwin, true or not, is not necessarily atheistic; on the contrary, it may simply be suggesting a larger idea of divine providence and skill." Divino Afflante Spiritu, published in 1953, encouraged Christian theologians to revisit original versions of the Bible in Greek and Latin. Noting improvements in archeology, the encyclical reversed Pope Leo XIII's Providentissimus Deus (1893), which had only advocated going back to the original texts to resolve ambiguity in the Latin Vulgate. In two speeches on October 29, 1951, and November 26, 1951, Pope Pius XII accepted the "Rhythm Method" as a moral form of family planning, although only in limited circumstances. Although some Catholics interpreted the 1930 encyclical Casti Connubii by Pope Pius XI to allow moral use of the Rhythm Method, these two speeches by Pius XII were the first explicit Church acceptance of the method. Unlike some earlier pontiffs, Pius's religious convictions did not cause him to oppose modern science. In fact, he was an energetic proponent of the theory of the Big Bang. As he told the Pontifical Academy of Sciences in 1951: "...it would seem that present-day science, with one sweep back across the centuries, has succeeded in bearing witness to the august instant of the primordial Fiat Lux [Let there be Light], when along with matter, there burst forth from nothing a sea of light and radiation, and the elements split and churned and formed into millions of galaxies." During his reign, Pius XII canonized thirty-four saints, including Saint Margaret of Hungary, Gemma Galgani, Mother Cabrini, Catherine Labouré, John de Britto, Joseph Cafasso, Saint Louis de Montfort, Nicholas of Flue, Joan of France, Duchess of Berry, Maria Goretti, Dominic Savio, Pope Pius X, and Peter Chanel. He also beatified six people, including Justin de Jacobis, and named Saint Casimir the patron saint of all youth. Only twice in his pontificate did Pius XII hold a consistory to elect new cardinals, a notable contrast with his predecessor, Pius XI (who had done so seventeen times in seventeen years). Pius XII chose not to name new cardinals during World War II, and the number of cardinals dwindled to 38. The first of these occasions (February 18, 1946)—which has become known as the "Grand Consistory"—yielded the elevation of a record 32 new cardinals (previously Leo X's elevation of 31 cardinals in 1517 had held this title). Together with the first post-war consistory in 1953—where Msgr. Tardini and Msgr. Montini were notably not elevated—the "Grand Consistory" brought an end to over five hundred years of Italians constituting a majority of the College of Cardinals. Earlier, in 1945, Pius XII had dispensed with the complicated papal conclave procedures, which attempted to ensure secrecy while preventing Cardinals from voting for themselves, compensating for this change by raising the requisite majority from two-thirds to two-thirds plus one. During the war, the pope was widely praised for making a principled stand. For example, Time Magazine credited Pius XII and the Catholic Church with "fighting totalitarianism more knowingly, devoutly, and authoritatively, and for a longer time, than any other organized power." Some early works echoed these favorable sentiments, including Polish historian Oskar Halecki's Pius XII: Eugenio Pacelli: Pope of Peace (1954) and Nazareno Padellaro's Portrait of Pius XII (1949). Many Jews publicly thanked the pope for his help. For example, Pinchas Lapide, a Jewish theologian and Israeli diplomat to Milan in the 1960s, estimated that Pius "was instrumental in saving at least 700,000 but probably as many as 860,000 Jews from certain death at Nazi hands." Some historians have questioned these figures. Catholic scholar Kevin Madigan interprets this and other praise from prominent Jewish leaders, including Golda Meir, as politically expedient attempts to secure Vatican recognition of the State of Israel. On September 21, 1945, the general secretary of the World Jewish Council, Dr. Leon Kubowitzky, presented an amount of money to the pope, "in recognition of the work of the Holy See in rescuing Jews from Fascist and Nazi persecutions." In the same year, Harry Greenstein from Baltimore (a close friend of Chief Rabbi Herzog of Jerusalem) told Pius how grateful Jews were for all he had done for them. "My only regret," the pope replied, "is not to have been able to save a greater number of Jews." Conversely, Pius was also criticized during his lifetime. For example, five years after World War II, Leon Poliakov wrote that Pius had been a tacit supporter of Vichy France's anti-Semitic laws, calling him "less forthright" than Pope Pius XI, either out of "Germanophilia" or the hope that Hitler would defeat communist Russia. In 1963, Rolf Hochhuth's controversial drama Der Stellvertreter. Ein christliches Trauerspiel (The Deputy, a Christian tragedy, released in English in 1964) portrayed Pope Pius XII as a hypocrite who remained silent about the Holocaust. Conversely, he was also defended in books such as Dr. Joseph Lichten's A Question of Judgment (1963), written in response to The Deputy. Lichten labeled any criticism of the pope's actions during World War II as "a stupefying paradox" and said, "[N]o one who reads the record of Pius XII's actions on behalf of Jews can subscribe to Hochhuth's accusation." Critical scholarly works like Guenther Lewy's The Catholic Church and Nazi Germany (1964) also followed the publication of The Deputy. In 2002, the play was adapted into the film Amen. In the aftermath of the controversy surrounding The Deputy, in 1964 Pope Paul VI authorized four Jesuit scholars to access the Vatican's secret archives, which are normally not opened for seventy-five years. A selected collection of primary sources, Actes et Documents du Saint Siège relatifs à la Seconde Guerre Mondiale, was published in eleven volumes between 1965 and 1981. The Actes documents are not translated from their original language (mostly Italian) and the volume introductions are in French. Only one volume has been translated into English. Notable documents not included in the Actes are letters from Bishop Konrad Preysing of Berlin to Pope Pius XII in 1943 and 1944, the papers of Austrian bishop Alois Hudal, and virtually everything appertaining to Eastern Europe. Saul Friedlander's Pope Pius and the Third Reich: A Documentation (1966) did not cite the Actes and drew instead on unpublished diplomatic documents from German embassies. Most later historical works, however, draw heavily on the Actes. In 1999, John Cornwell's Hitler's Pope criticized Pius for not doing enough, or speaking out enough, against the Holocaust. Cornwell argues that Pius's entire career as the nuncio to Germany, cardinal secretary of state, and pope was characterized by a desire to increase and centralize the power of the Papacy, and that he subordinated opposition to the Nazis to that goal. He further argues that Pius was an anti-Semite and that this stance prevented him from caring about the European Jews. Cornwell's work was the first to have access to testimonies from Pius's beatification process as well as to many documents from Pacelli's nunciature which had just been opened under the seventy-five year rule by the Vatican State Secretary archives. Cornwell concluded, "Pacelli's failure to respond to the enormity of the Holocaust was more than a personal failure, it was a failure of the papal office itself and the prevailing culture of Catholicism." Cornwell's work has received much praise and criticism. Much of its plaudits center around the fact that he was a practising Catholic who had attempted to absolve Pius with his work, only reluctantly discovering the depth of papal involvement. However, later works, such as Susan Zuccotti's Under His Very Windows: The Vatican and the Holocaust in Italy (2000) and Michael Phayer's The Catholic Church and the Holocaust, 1930–1965 (2000), are critical of both Cornwell and Pius. Indeed, Cornwell's scholarship has itself been roundly criticized. For example, Kenneth L. Woodward stated in his review in Newsweek that "errors of fact and ignorance of context appear on almost every page." Cornwell himself gives a more ambiguous assessment of Pius' conduct in a 2004 interview where he states that "Pius XII had so little scope of action that it is impossible to judge the motives for his silence during the war." Most recently, Rabbi David Dalin's The Myth of Hitler's Pope argues that critics of Pius are liberal Catholics who "exploit the tragedy of the Jewish people during the Holocaust to foster their own political agenda of forcing changes on the Catholic Church today" and that Pius XII was actually responsible for saving the lives of thousands of Jews. In 2005, Corriere della Sera published a document dated November 20, 1946 on the subject of Jewish children baptized in war-time France. The document ordered that baptized children, if orphaned, should be kept in Catholic custody and stated that the decision "has been approved by the Holy Father." Nuncio Angelo Roncalli (who would become Pope John XXIII) ignored this directive. Abe Foxman, the national director of the Anti-Defamation League (ADL), who had himself been baptized as a child and had undergone a custody battle afterward, called for an immediate freeze on Pius's beatification process until the relevant Vatican Secret Archives and baptismal records were opened. Two Italian scholars, Matteo Luigi Napolitano and Andrea Tornielli, confirmed that the memorandum was genuine, although the initial reporting by the Corriere della Sera was misleading as the document had originated in the French Catholic Church archives rather than the Vatican archives. Further, it strictly concerned itself with children without living blood relatives who were supposed to be handed over to Jewish organizations. In 1999, in an attempt to address some of this controversy, the Vatican appointed the International Catholic-Jewish Historical Commission (ICJHC), a group composed of three Jewish and three Catholic scholars to investigate the role of the Church during the Holocaust. In 2001, the ICJHC issued its preliminary finding, raising a number of questions about the way the Vatican dealt with the Holocaust, titled "The Vatican and the Holocaust: A Preliminary Report." The Commission discovered documents making it clear that Pius was aware of widespread anti-Jewish persecution in 1941 and 1942, and they suspected that the Church may have been influenced in not helping Jewish immigration by the nuncio of Chile and by the Papal representative to Bolivia, who complained about the "invasion of the Jews" in their countries, where they engaged in "dishonest dealings, violence, immorality, and even disrespect for religion." The ICJHC raised a list of 47 questions about the way the Church dealt with the Holocaust, requested documents that had not been publicly released in order to continue their work, and, not receiving permission, disbanded in July of 2001, having never issued a final report. Unsatisfied with the findings, Dr. Michael Marrus, one of the three Jewish members of the Commission, said the commission "ran up against a brick wall.… It would have been really helpful to have had support from the Holy See on this issue." ↑ The "Black Nobility" who sided with the Vatican in opposition to King Vittorio Emanuele II. ↑ Pollard 2005, p. 70. ↑ Marchione 2004, p. 1. ↑ Marchione 2000, p. 4. ↑ 5.0 5.1 5.2 Marchione 2000, p. 193. ↑ 6.0 6.1 6.2 Marchione 2004, p. 10. ↑ 7.0 7.1 Marchione 2004, p. 9. ↑ Dalin 2005, p. 47. ↑ Dalin 2005, p. 48. ↑ Levillain 2002, p. 1211. ↑ Marchione 2004, p. 11. ↑ Dalin 2005, p. 49. ↑ Sanchez 2002, pp. 103–104. ↑ Signed March 29, 1924; ratified by Parliament on January 15, 1925. ↑ Kent 2002, p. 24. ↑ Dalin 2005, pp. 58–59. ↑ Phayer 2000, p. 3. ↑ Walter Bussmann, "Pius XII an die deutshen Bischofe," Hochland 61 (1969):61–65. ↑ 22.0 22.1 22.2 Gutman 1990, p. 1136. ↑ Volk 1972, pp. 34f., 45–58. ↑ Scholder 1987, vol. 1: especially Part 1, chapter 10; Part 2, chapter 2. ↑ Heinrich Brüning, Memoiren, English translation as quoted in Scholder 1987, pp. 152–3. ↑ Volk 1972, pp. 98–101; Feldkamp 2000, pp. 88–93. ↑ Volk 1972, pp. 101, 105. ↑ Volk 1972, p. 254. ↑ Phayer 2000, p. 16; Sanchez 2002, pp. 16–17. ↑ Dalin 2005, p. 76. ↑ Gutman 1990, vol. 2, p. 739. ↑ Rychlak 2000, pp. 414–15, n. 61. ↑ Mary Ball Martinez, "Pope Pius XII and the Second World War," Journal of Historical Review 13 (1993). ↑ Report by the Polish Ambassador to the Holy See on the Situation in German-occupied Poland, Memorandum No. 79, May 29, 1942, Myron Taylor Papers, NARA. ↑ Rittner and Roth 2002, p. 4. ↑ 39.0 39.1 39.2 39.3 39.4 Gutman 1990, p. 1137. ↑ Kent 2002, pp. 87–100. ↑ Jeffrey Lesser, Welcoming the Undesirables: Brazil and the Jewish Question (University of California Press, 1995), pp. 151–168. ↑ McInerny 2001, p. 49. ↑ Perl 1989, p. 200. ↑ Phayer 2000, p. 5. ↑ Delpech, Les Eglises et la Persécution raciale, p. 267. ↑ Perl 1989, p. 206. ↑ Lapide 1980, p. 139. ↑ Phayer 2000, pp. 27-28. ↑ Robinson, Feldman, and Yahill 1974, p. 133; Gutman 1990, p. 1137. ↑ Hilberg 2003, p. 315. ↑ Robinson, Feldman, and Yahill 1974, p. 136. ↑ Actes et documents du Saint Sie'ge relatifs a` la Seconde Guerre mondiale / e'd. par Pierre Blet, Angelo Martini, Burkhart Schneider. April 7, 1943. ↑ Robinson, Feldman, and Yahill 1974, p. 134. ↑ E. Zolli 1997. Reissued in 1997 as Why I Became a Catholic. ↑ Robinson, Feldman, and Yahill 1974, p. 133. ↑ Gilbert 1987, p. 623. ↑ Letter of Pius XII of April 30, 1943 to the Bishop of Berlin, Graf von Preysing, published in "Documentation catholique" of February 2, 1964. ↑ Berel Lang, "Not Enough" vs. "Plenty": Which did Pius XII do?. Judaism, Fall 2001. Retrieved January 21, 2009. ↑ 64.0 64.1 Gutman 1990, p. 1138. ↑ Gilbert 1987, p. 701. ↑ Perl 1989, p. 176. ↑ Pina Baglioni, 30 Days - The Holy Father orders…. 30Days, August 2006. Retrieved November 2, 2006. ↑ Bess Twiston Davies, Faith news - Comment - Times Online, The Times, August 19, 2006. Retrieved November 2, 2006. ↑ Phayer, 2002, "Ethical Questions about Papal Policy," in Pope Pius XII and the Holocaust, pp. 228–229; Catholic University of America Archives, 37/133 #112. ↑ Sanchez 2002, pp. 94–95. ↑ Dalin 2005, pp. 69–70. ↑ Catholic Forum, Pope Pius XII. Retrieved January 21, 2009. ↑ Pollard 2005, pp. 6–7. ↑ Humani Generis, 1950. Retrieved January 21, 2009. ↑ Intelligent Design belittles God, Vatican director says Catholic Online. Retrieved January 21, 2009. ↑ Divino Afflante Spiritu, 1953. Retrieved January 21, 2009. ↑ Moral Questions Affecting Married Life. Addresses given October 29, 1951 to the Italian Catholic Union of midwives and November 26, 1951 to the National Congress of the Family Front and the Association of Large Families, National Catholic Welfare Conference, Washington, D.C. Retrieved January 21, 2009. ↑ Doug Linder, The Vatican's View of Evolution: The Story of Two Popes, 2004. Retrieved January 21, 2009. ↑ Pius XII beatified Dominic Savio in 1950 and canonized him in 1954. ↑ Levillain 2002, p. 1136. ↑ Time, August 16, 1943. ↑ Lapide 1967, quoted in Dalin 2005, p. 11. ↑ Kevin Madigan, Judging Pius XII, page 2, Christian Century, March 14, 2001. Retrieved January 21, 2009. ↑ McInernny 2001, p. 155. ↑ Leon Poliakov, "The Vatican and the 'Jewish Quesiton': The Record of the Hitler Period—and After," Commentary 10 (November 1950):439–449. ↑ Joseph Lichten, A Question of Judgement, 1963. Retrieved January 21, 2009. ↑ Phayer 2000, p. xvii. ↑ Phayer 2000, p. xii–xiii. ↑ Sanchez 2002, p. 34. ↑ Kenneth L. Woodward, Newsweek, September 27, 1999. ↑ For God's sake, The Economist, Dec. 9, 2004. Retrieved January 21, 2009. ↑ Dalin 2005, p. 3. ↑ Jerusalem Report, February 7, 2005. ↑ Anti-Defamation League, ADL to Vatican: Open Baptismal Records and Put Pius Beatification on Hold, January 13, 2005. Retrieved January 21, 2009. ↑ Dimitri Cavalli, Pius's Children, The American, April 1, 2006. Retrieved January 21, 2009. ↑ 104.0 104.1 ICJHC 2000. ↑ Melissa Radler, "Vatican Blocks Panel's Access to Holocaust Archives," The Jerusalem Post, July 24, 2001. Cornwell, John. 1999. Hitler's Pope: The Secret History of Pius XII. Viking. ISBN 0-670-87620-8. See also Amazon Online Reader. Retrieved January 21, 2009. Cushing, Richard. 1959. Pope Pius XII. Paulist Press. ICJHC. 2000. The Vatican and the Holocaust: A Preliminary Report. Retrieved January 21, 2009. Lapide, Pinchas. 1980. The Last Three Popes and the Jews. London: Souvenir Press. McDermott, Thomas. 1946. Keeper of the Keys: A Life of Pope Pius XII. Milwaukee: Bruce Publishing Company. Paul, Leon. 1957. The Vatican Picture Book: A Picture Pilgrimage. New York: Greystone Press. Rychlak, Ronald J. 2000. Hitler, the War, and the Pope. Our Sunday Visitor. ISBN 0-87973-217-2. Also see Amazon Online Reader. Retrieved January 21, 2009. Scholder, Klaus. 1987. The Churches and the Third Reich. London. Zolli, Israel. 1997. Before the Dawn. Roman Catholic Books (Reprint edition). ISBN 0-912141-46-8. Also see Amazon Online Reader. Retrieved January 21, 2009. Complete Text of the Concordat between the Vatican and the Third Reich. This page was last modified on 29 March 2019, at 20:41.